The Top 10 stories from F&SF that were turned into TV shows or movies. We’ll start with this one because the movie hasn’t been completed yet. Here’s a first glimpse of Idris Elba as The Gunslinger, Roland Deschain. Scheduled for release in February 2017. 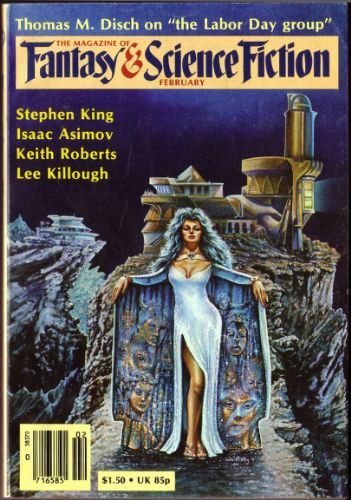 Based on: A series of stories by Stephen King that appeared in F&SF between 1978 and 1981, which were published in book form as The Gunslinger in 1982. One of the most highly rated episodes of the new Outer Limits, television series, this tells the story of people enslaved by the AI aboard a military spaceship. This is a rare case where Kurt Vonnegutt, Jr.’s original story, “Harrison Bergeron,” may be more famous than the adaptation. Sean Astin starred in this 1995 Showtime about a future where everyone is forced to be equal and no one can excel. The story was also adapted into short films again in 2006 (“Harrison Bergeron,” directed by Patrick Horne) and 2009 (“2081,” directed by Chandler Tuttle). 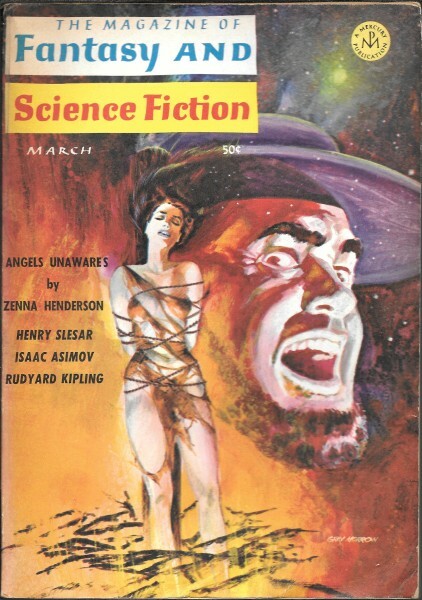 Based on: “The People” was a long-running series of 16 stories in F&SF written by Zenna Henderson. 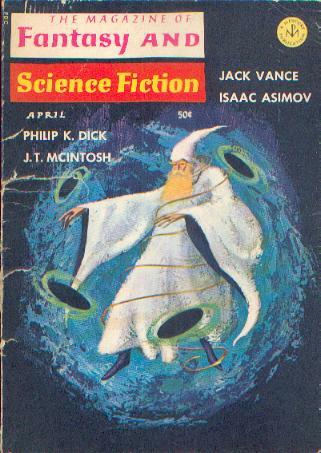 This film is mostly based on the novella “Pottage” (F&SF, September 1955), but also contains elements from the stories “Ararat” (F&SF, October 1952), “Gilead” (F&SF, October 1954), and “Captivity” (F&SF, June 1958). Hugh Jackman and Evangeline Lilly starred in this science fiction movie about second chances, when a down-on-his-luck promoter turns a discarded robot into a champion and rebuilds his personal life in the process. John Cusack starred in this film about a science fiction writer who decides to adopt a neglected and socially awkward child who believes that he’s from Mars. 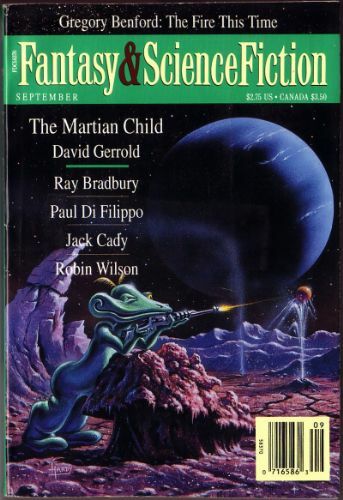 Based on: “The Martian Child” by David Gerrold (F&SF, September 1994). There are some differences between the film and story, including the fact that the father in the story is gay which gives him additional insight into dealing with his son. This novelette swept the Hugo, Nebula, and Locus awards. A Disney animated feature about a toaster and other household items that journey to the city to find their family after being left behind at a cabin in the woods. The success of the movie spawned two direct-to-video sequels, “The Brave Little Toaster to the Rescue” (1997) and “The Brave Little Toaster Goes to Mars” (1998), the latter based on a book published in 1988. 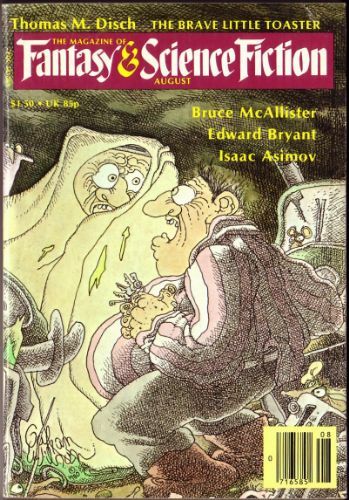 Based on: “The Brave Little Toaster” by Thomas M. Disch (F&SF, August 1980). This novella was nominated for the Hugo and Nebula Award, and won the Locus, British Science Fiction Association, and Seiun Awards. Paul Verhoeven’s satirical movie about humans fighting alien bugs for the survival of mankind created a franchise, spinning off three direct-to-video sequels and a number of games. 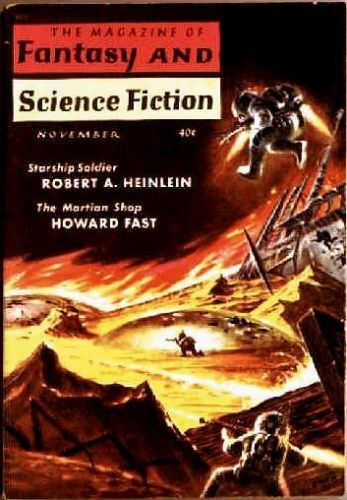 Based on: “Starship Soldier” by Robert A. Heinlein (F&SF, October and November 1959). 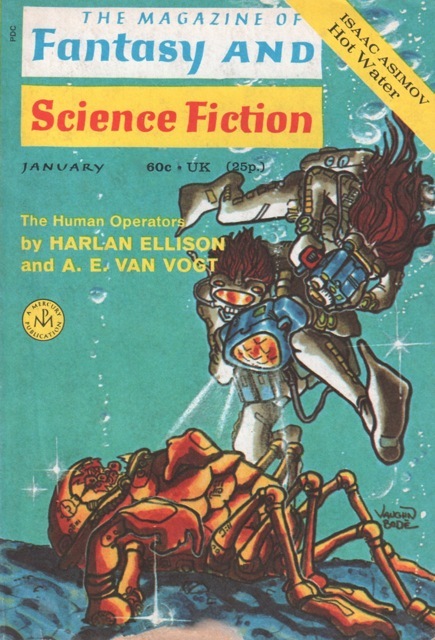 The novel Starship Troopers originally ran as a serial in two issues of F&SF, October and November 1959, before being published as a novel by Putnam in December of the same year. 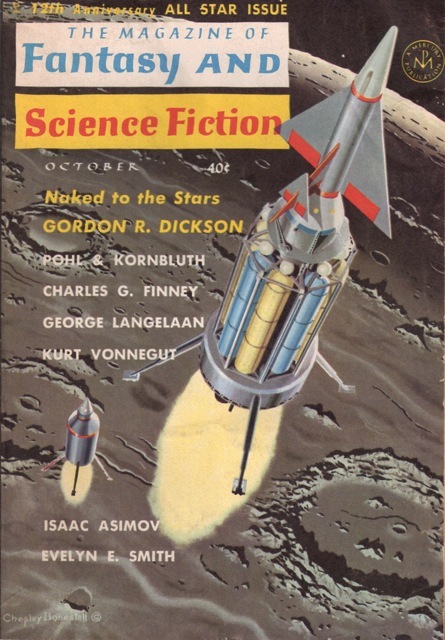 The movie and the novel are only tangentially related to one another, but the long-term influence of Heinlein’s story is hard to deny, whether it’s people developing the idea or reacting against it, in novels (Harrison’s, Bill, The Galactic Hero, Haldeman’s Forever War, Card’s Ender’s Game, and Scalzi’s Old Man’s War to name a few) and in pop culture, including James Cameron, who borrowed terms from the novel for the movie Aliens and made the cast read the novel before they started filming. Another Paul Verhoeven movie takes our second spot. When “Total Recall” was released in 1990, it was one of the most expensive movies ever made, a gamble that paid off in box office success, and it cemented Arnold Schwarzenegger’s role as a science fiction action hero. The movie won the 1991 Oscar for Best Special Effects and stands up very well over time. It led to a novelization, a TV series (“Total Recall 2070”), video games, a comic book series, and a 2012 remake starring Colin Farrell and Kate Beckinsale. This story about a mentally challenged man who becomes a genius with medical intervention and then sees his intelligence slowly slip away again has become both a common plot trope (see the episode “HOMЯ” of “The Simpsons,” which won an Emmy) and a pop culture reference (Deadspin described the action movie “The Bourne Legacy” as “‘Flowers for Algernon’ with face-punching”). Cliff Robertson won the 1969 Oscar for Best Actor for his performance in this film, and screenwriter Stirling Silliphant won the Golden Globe Award for Best Screenplay. 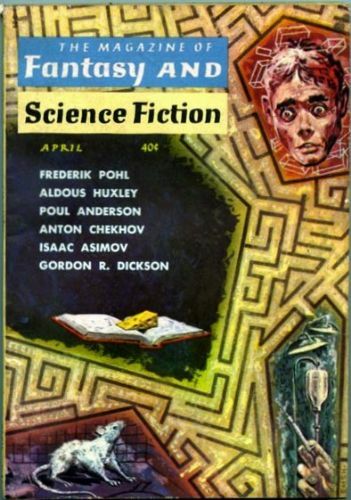 Keyes was a newer writer in 1959 and his name didn’t even make the Emsh cover that illustrates his story, but “Flowers for Algernon” captured everyone’s imagination and went on to win the Hugo in 1960. In addition to “Charly,” the story has been adapted for film and television around the world. Keyes famously wrote the story originally for Galaxy magazine, but the editor, Horace Gold, insisted that he change the ending so that Charlie stayed a genius, got married, and lived happily ever after. 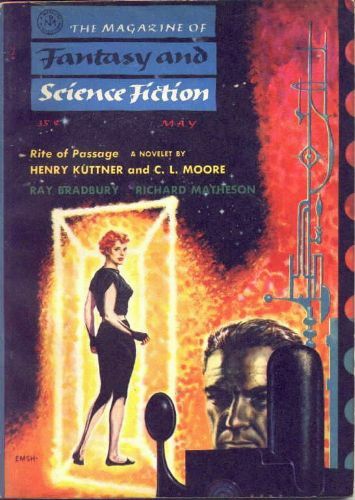 Keyes refused and sold it to F&SF instead, which published it with the original ending. And the rest, as they say, is history.